The NS Series nut splitters available from Enerpac (A Division of Actuant Corp) are powerful and precise industrial strength hydraulic tools designed for multiple applications in diverse industries. NS Series nut splitters with interchangeable heads from Enerpac are compact, powerful and manoeuvrable 700 bar high-pressure hydraulic tools often used on flanged joints commonly found in the oil, gas, energy, mineral processing, water and infrastructure industries. Nut splitters also find application in industries where bolting and pipelines are used extensively. Enerpac nut splitters are specially designed to suit standard ANSI B16.5/BS1560 flanges. The nickel-plated cylinder bodies have excellent corrosion protection and improved durability in harsh environments. Heavily corroded and weathered nuts can be quickly split and removed. Several interchangeable heads are available to provide maximum nut range flexibility and the single-acting, spring return or double-acting operation allows the splitter to be used with a variety of hydraulic power sources including the comprehensive range of innovative pumping technologies available from Enerpac. Tri-blade technology provides three cutting surfaces on a single blade, facilitating easy changes in the field. Grip tape and handle are included for more secure maneuverability. A pre-set blade cutting depth scale in each tool is a standard feature and allows controlled blade extension to avoid damage to bolts and threads. The scale indicates the bolt range in metric and imperial values on each cutting head. NS Series nut splitters cut hexagon nut sizes from 70mm - 130mm in a bolt range from M45 - M90. 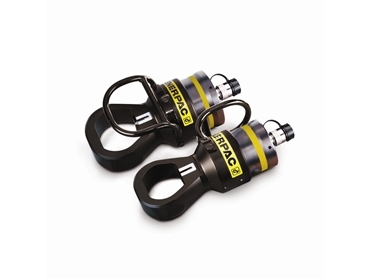 Using high-pressure 700 bar technology to reduce weight and size while maximising compactness, the NS series of nut splitters complements Enerpac’s advanced range of safety-oriented, energy-saving and labour-saving technologies. All Enerpac hydraulic tools and cylinders are complemented by a broad range of advanced pumping technologies ranging from simple portable hand pumps and versatile battery pumps to new generation electric and air-over-hydraulic technologies. Enerpac has been established in Australia and New Zealand as a major supplier of high-pressure 700 bar hydraulic equipment for over 50 years with nationwide service backup and a strong distribution network.